Nadine writes: What app or program can I use to add text to photos on my Mac? I need to make a souvenir photo album on CD and need some help to add text in each photo. I know about Photoshop but it’s quite expensive. Is there anything that’s more price-friendly? Hi Nadine! 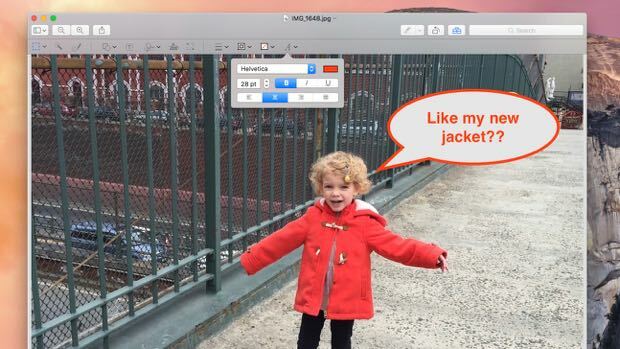 No, you don’t need to pony up for Photoshop (or even the cheaper Photoshop Elements) if all you want to do is add text to photos on your Mac, or draw an arrow or two on your snapshots. Indeed, there’s an app sitting on your Mac right now that’ll do the trick. You can right-click an image to open it in Preview. 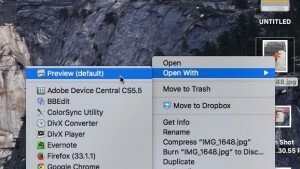 Just go to the Applications folder on your Mac’s hard drive—or, better yet, just open Spotlight by clicking the magnifying glass button in the top-right corner of your desktop—find the Preview app, and launch it. Now, let’s try some markup tools. Click the Text button (the one marked with a “T”) to add text to photos. Once you click the button, the word “Text” will appear on the image, flanked by a pair of blue handles. Double-click the text and start typing to add your own text, or click and drag to move the text wherever you’d like. You can also select the text with your cursor, then click the “A” button in the Markup Toolbar to change the color and font of the text. Click a button in Preview’s Markup Toolbar to add text, shapes, arrows, and more. Ready to try an arrow or a circle? 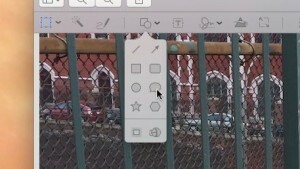 Click the Shapes button (the one with the square and circle), then click an option: anything from a line or an arrow to a bubble or a star. You can then drag and resize the shape to your heart’s content, or change its color by clicking the Border Color button in the toolbar. You can also draw freeform lines with the Sketch took, trace and add a signature by clicking the Sign button, or crop the image with the Image Size tool. Hope that helps, Nadine. Still have questions? Let me know!